There goes the neighbourhood! Why we should ALL be snobbish about metal detecting. 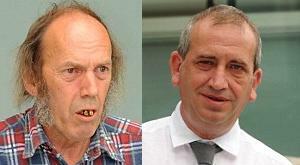 Michael Darke and Keith Lewis who battled in 2010 over which of them should get £300,000 from you the taxpayer. This latest case interested me as they had been searching in fields I used to play in. My grandfather owned the adjoining farm and we village kids spent lots of time there. What’s eating me is how things have changed since those distant times in the fifties. I recall Jimmy Perks finding an artefact there (there’s a Roman road there) and all of us proudly processing, Cider-with Rosie style, to our headmaster’s house to present it to him “for the museum” (no-one thought there was any alternative). He made a big fuss about it – both in school assembly and the local press and sure enough it went off to the local museum, with full details. For me that’s proper “community archaeology” – a village’s past revealed to the villagers and everyone benefiting. 60 years later those fields are subject to very different people and attitudes. For one churlish thing, if their forums are a guide, they are mostly people with far less spelling ability than the 1950’s village schoolchildren who preceded them – but that’s unacceptably snobbish of course and a separate matter the Government should explain. However, I am prepared to be snobbish about them if the word can be used in a heritage-friendly way, meaning “to appreciate those who engage in a shared learning process but not those who are non-sharing or personally exploitative”. Actually, everyone should be snobbish about that since most detectorists fall into that latter category. It seems to me the authorities have been so anxious to be “inclusive” and avoid the first sort of snobbery that they’ve totally forgotten the importance of maintaining the second sort. So I hope that’s clear about my snobbism. I don’t mind a lot of them being, as PAS says, “challenged by formal education” nor that they come all the way from Dudley to our little village of Claverley to do over “our” fields (much) but I do deeply resent the fact that statistically most of them won’t have reported most of their finds and that statistically more than 95% of them never renounce their treasure rewards despite all of them swearing blind they’re only doing it for the love of History. Shouldn’t everyone be snobbish about that?. BTW, in the next county to Claverley is the similarly named village of Abberley. There, some excellent real community archaeology has just been happening, see below, just like we did in the fifties. Naturally, not one of the participants took any finds home or reckoned they should own them or sold them on EBay or claimed a Treasure reward or fought over who got one! Metal detecting is NOT archaeology so stop making damaging comparisons. Of course it isn’t, which is precisely why we object to the way it is mostly carried out. Surely you aren’t saying that because it isn’t archaeology it doesn’t need to be judged in terms of the damage it does? If so, why?